We install decorative Stamped Concrete Pool Decks. Picking a paving material for your swimming pool decking is a fundamental part of your pool design. Exactly what to pick can typically be puzzling. Among the primary concerns is frequently budget plan. Of course that is always an issue in a landscape project, but with swimming pool decking it is especially important because of the huge amount of area that is normally involved. ​One of the least expensive materials is concrete. You can also add color to concrete. Do not include color, such as a stain, to the concrete after it is poured, as it will not hold up well. ​When using concrete as your paving product, you may or might not utilize the same concrete for the swimming pool coping product. The coping is the product that edges the swimming pool itself adjacent to the rest of the paving. ​If you decide to have a concrete coping, there are a few various methods this can be done. The very first is to run the concrete right up to the water's edge making use of a cantilevered coping. There is no break or border around the coping. The entire pool decking location, including the coping, appears as one material and looks unified. ​You can also have a concrete coping that resembles a border walking around the swimming pool. Right here, there is a certain line which is typically a joint defining the coping from the swimming pool paving. Nevertheless, I like the cantilevered look. ​Another option is to use an entirely different product. You can make use of brick, stone or pavers as the coping. This produces a separate border around the pool in a various material and can look really nice. Nevertheless, it does add on to the cost a fair bit. ​Stamped concrete is an old product, concrete with an excellent new look makings it far more attractive for many uses today. 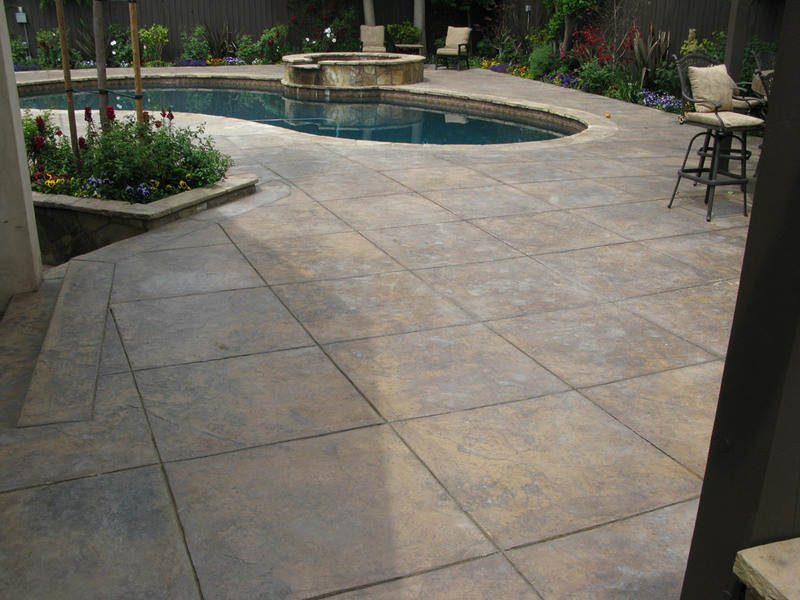 Stamped concrete can simulate numerous other materials such as tiles, cobblestones, wood, and stone. It can be impressed with a range of textures and is then normally colored to additional contribute to the resemblance of the material it imitates. ​There are circumstances where plainly the most superior product is concrete in terms of strength and resilience but is not chosen due to its appearance. A walkway made from concrete can be smooth, exempt to buckling or separation as cobblestones might be, however far less appealing than a stone sidewalk. Stamped concrete enables the house owner to have the beautiful sidewalk they want but also have the strength of concrete to make it last. ​Concrete that has actually been stamped has actually been around a long period of time. It is only recently that advances in coloration and texture imprinting have made it really a sensible choice for the discerning owner and builder. In the past it was a less than satisfying solution utilized by those who simply needed to have concrete in contrast to other materials and it was rather clearly visually second-rate. ​Today concrete that has actually been textured and colored is still concrete with all its strengths but it also is far more kindling to the eye. This product is beginning to be common not only in businesses however in high end houses. While a stamped concrete sidewalk might look just like another material such as natural stone or cobble stones it has few of the same weak points of this product making frequent repair services required. ​The stamping procedure for concrete isn't really an easy do it yourself task. It needs specific devices and skill and is a multistage affair. While pouring concrete is fairly straight forward and almost anyone can do it, the stamping and structure impression procedure is often strictly a job for the skilled specialist. ​With this process, concrete is poured as usual however in an extremely thick layer more than 4 inches. Colors are often contributed to concrete in the mixer, if not then they are used after the concrete is poured. A release agent is applied to the surface area of poured concrete, this will permit the structure mats to positioned on the concrete impressed and then release without getting rid of the concrete. ​When the concrete dries for about 24 hours the release agent have to be cleaned off the surface area. After the concrete dries a clear sealant is applied to preserve the color and structure of the stamping. This might appear like an extremely complex procedure and it is, but when sturdiness is a need to but looks are likewise desired there is no substitute or competitors for this kind of concrete. ​While colored and textured concrete can't contend in terms of looks with the genuine thing such as cobblestones or flagstones it has obvious advantages. This old product has a amazing and fresh make over thanks to some great advances in the last few years. Occasionally enhancements in old products are as interesting as brand new materials. ​Stamped concrete is an old material, concrete with an excellent brand-new look which makes it far more appealing for numerous uses today. Stamped concrete permits the house owner to have the stunning pathway they prefer however likewise have the strength of concrete to make it last. ​Today concrete that has actually been textured and colored is still concrete with all its strengths however it likewise is much more pleasing to the eye. Colors are frequently included to concrete in the mixer, if not then they are used after the concrete is poured. A release representative is used to the surface of poured concrete, this will permit the structure mats to put on the concrete impressed and then release without eliminating the concrete.